When you consider all the people living and working at apartment communities, it’s not hard to imagine that the multifamily industry could affect real change in neighborhoods across the country. So we wanted to know how properties and associations are harnessing their people power and using it do good. Which brands are making a difference through philanthropy? What social efforts are apartment companies undertaking, and how do they encourage resident and staff participation? Q1: What are some brands you admire for their philanthropic efforts and community involvement? Why do you like these programs? Q2: What philanthropies are you working with? What kind of social efforts are you involved with at your company? Q3: How do you encourage your employees to get involved in their community? Do you offer paid time for volunteering? Anything else? Q4: How you do communicate philanthropic efforts to residents? Do you get them involved? Do you ever support residents’ causes? Q5: What kind of philanthropic programs would you like to see multifamily be more involved with? What are your associations doing? What are some brands you admire for their philanthropic efforts and community involvement? Why do you like these programs? What philanthropies are you working with? What kind of social efforts are you involved with at your company? How do you encourage your employees to get involved in their community? Do you offer paid time for volunteering? Anything else? 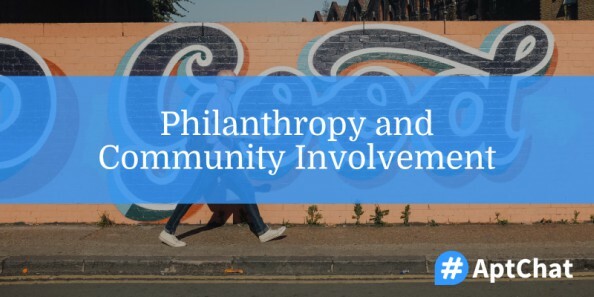 How you do communicate philanthropic efforts to residents? Do you get them involved? Do you ever support residents’ causes? What kind of philanthropic programs would you like to see multifamily be more involved with? What are your associations doing? Our next #AptChat is slated for Tuesday, November 1, 2016 at 12 pm Eastern. We’ll be discussing marketing training for on-site employees. In the meantime, be sure to sign up for #AptChat updates to get these recaps and more delivered straight to your inbox!